Valor Fitness BD-62 is a modern design wall mount cable station. It is rated 4.7 out of 5 stars by 25 customers on the day of this review, which indicates a great deal of customer satisfaction. It is both functional and durable with a heavy-duty steel (has a weight capacity of 250 pounds) and feels rather stable after being fixed to the wall. You will get two adjustable hand straps included in the box and there are 17 adjustable positions on each side. You can extend the handles or replace the straps with a bar and use that as well, to target slightly different muscles. You may use the Olympic style and regular plates on the Valor BD-62. And the 250 lb. total weight capacity is quite reasonable. Valor Fitness BD-62 weighs 17 pounds and measures 80 x 5 x 4 inches and the vertical and compact design with a footprint of just 25 x 25 inches on the floor that doesn’t occupy much of your gym area and helps you save on space at home. You may lower the pulley to do your leg exercises but because only the upper part is fixed to the wall, this may be a little risky and the bottom section of the unit could move forward. You can use it for legs comfortably if you manage to mount the bottom part to the wall as well. Attachments like single D-handle, double D-handle, and V-shaped bar can be ordered with your purchase as a bundle or later on when you need them. You can use this cable station just like other cable machines at the gym, targeting different smaller body parts with these different attachments. You can’t really do normal crossovers with two hands as the handles are too close to each other for crossovers. But you can use one handle and do a one-handed crossover or chest fly at a time. Or you can alternatively get two of these or look for a larger alternative model. Like with many other cable machines the resistance ratio is 1:1 and if you put 80 pounds of weight you will experience the full 80 pounds and the additional pulley drag. You can’t lock it into the top hole due to the pulleys at the top. It would be nice if there was an exercise manual included in the package but you can always refer to the workout videos online. Some people are experienced and know what to do, but many people don’t. It is not super easy to put together with the incomplete written instructions but easier if you focus on the diagrams and if you have another person helping you out. 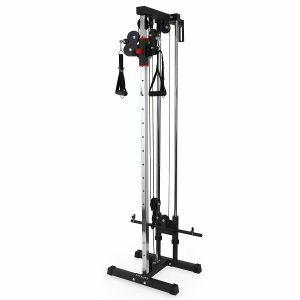 Valor Fitness BD-62 is quite functional and versatile and operates smoothly, takes up very little space, is good quality with a sturdy heavy-duty build, a nice addition to any home gym and a decent deal at the current price point. It is generally smooth but there can be a little bit of friction at times, unlike the commercial cable stations.The delivery is often quick via Amazon.com and the customer service is pretty good when you need help.